Filipina Superstar Toni Gonzaga performed in Orlando, Florida to the delight of many at the Osceola Performing Arts Center on Saturday August 7th, 2010. 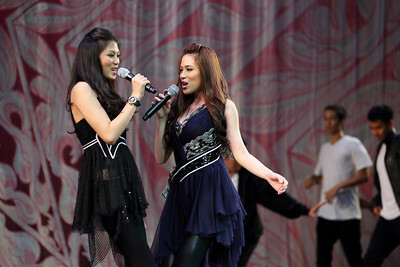 Toni Gonzaga is on a United States Concert Tour from her native homeland of the Philippines with her sister Alex Gonzaga. Her next destination is Houston, Texas at the University of Houston. My daughter enjoyed the sights and sounds of the TGIF! She especially liked the Toni and Alex Gonzaga's version of "Love Story" by Taylor Swift and "Baby" by Justin Bieber. The night was complete with an autographed CD Album Magazine "All Me" and a picture perfect photo with the sisters. I photographed the concert with the Canon EOS 1D Mark IV with the Canon EF 70-200mm f/2.8 L II lens. I shot 1080p video with the Canon EOS 5D Mark II with the Canon EF 70-200mm f/4 L II lens. You can view photos and videos in my TGIF! Toni Gonzaga In Florida 2010 Gallery. As for my audio setup for the video capture, I used two shotgun microphones. The Rode VideoMic was attached to the Canon 5D Mark II with manual audio control and the Azden SGM 1X attached to the wireless Sennheiser G2 EW100 transmitter and the wireless Sennheiser G2 EW100 receiver attached to the Canon 1D Mark IV. The wireless setup was needed for mobility because I was shooting pictures and video simultaneously. The 5D Mark II was on a Bogen 501HDV head with Manfrotto legs and the 1D Mark IV was handheld during the entire production. You can read more post production details in my Toni Gonzaga Youtube Video. Great job. I thought she was just an actress. So that was audio from 2 shotgun mics? Also was, this a paid gig for you, or just a personal event? I was not paid for this event. I wanted to shoot this concert and share the knowledge of what I learned from my experience with others. The most important item I discovered during loud concert venues is Audio levels. I set all my audio devices to the lowest db gain. It was -30db on the Rode Mic and -30db on the sensitivity on both wireless transmitter and receiver. The 5dMarkII manual audio level was one click above the lowest setting. I was crossing my fingers when I transcoded the footage into Final Cut Pro with the Canon E-1 Movie plugin. It turned out for the best at the end.